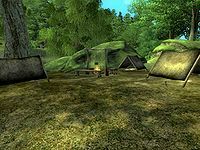 Camp 1 is a campsite southeast of the Imperial City containing NPCs (quest-related). It is occupied by a family of refugee farmers and their guide, who will ask you to help fix their Goblin Trouble. The NPCs that are temporarily staying here are Aloys Bincal, Barthel Gernand, Callia Bincal, and Mirisa. If you happen upon this camp in your travels, take care not to mistake the inhabitants for bandits and try and shoot them from afar or attack them; it will count as assault and you can rack up a hefty bounty this way. Once the Goblin Trouble quest is complete, the inhabitants pack up the camp and move to Cropsford leaving only the cooking spit. This issue has been addressed by the Unofficial Oblivion Patch; This isn't a bug, but the Unofficial Oblivion Patch removes the fireplace after the inhabitants leave.. This page was last modified on 3 June 2017, at 18:45.